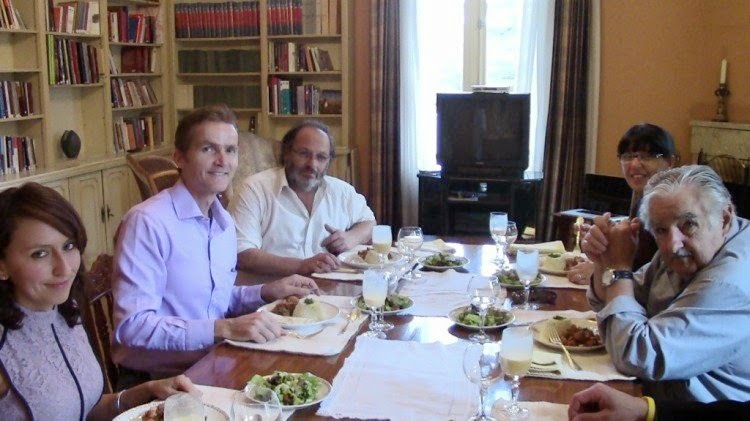 Voted the best president in the world, President of Uruguay, Jose “Pepe” Mujica agreed to allow Food for Life Global director, Paul Rodney Turner (Priyavrata das) to cook him a vegan lunch (prasadam) and then discuss setting up a Food for Life project in Montevideo. “My secretary Juliana Castaneda (Jagannath Priya) and I arrived at the Presidential house at 8am. The kitchen staff were waiting for my directions. We were also joined by a local ISKCON devotee, Lavanga Manjari. Our FFLG team made a sweet potato, spinach subji with bbq tomatoes, lemon rice, samosas, mango chutney, chapatis, lentil soup, avocado salad, and a mango/coconut milk lassi, finished off with the most incredible peppermint vegan ice cream choc-top pie! Yes, that was what you have to do when you cook for a president! “According to the house staff, this was the first time anyone has prepared a vegetarian, what to speak of a vegan lunch in the president’s house. They were all so excited and the head chef was furiously taking notes on all my recipes. “We finished in perfect time at 12noon and then myself, Jaggy and Lavanga made an offering of the food to God, to infuse the food with divine energy. “We then dined with the president, his secretary, the minister of social development, Mr. Daniel Olesker and our friend and famous sports reporter, Pepe Mansilla, who will be the new president of FFL Global Uruguay. We are so thrilled to have such a qualified man to lead the new project. Our lunch meeting went for 2 hours and included a 10 minute video of Food for Life’s work around the world. Jagannath Priya was absolutely on fire today talking to the president and making him smile and laugh. I was so proud of how she and Pepe represented Food for Life Global to the president, who only speaks Spanish. In fact, our meeting would not have been possible without the tenacity and devotion of Pepe Mansilla He had been working on this desire of mine for many months and finally on the day before we are to leave Uruguay, he made it all happen. He is a gentleman and we are so excited to have him as a new member of the FFL Global team. “The president was extremely impressed and praised our work throughout the meeting. He said to me: “Many people need education about the way they eat.” And he told me bluntly, “Welcome, the doors are fully open here for Food for Life.” The Minister of Social Development told us, he wants Food for Life to improve on what the government has been working on for years with improving the quality of meals to children. “We finished our meeting with the president signing autographs for all of us with a smile and some words of wisdom. I told the president that he is one of the few, if not the only president alive today that has integrity. It seems that all of the presidents of the world have sold out to corporate interests. “I wish there were more of you,” I told him. He replied, wow all those president must be really bad if you want more of me.